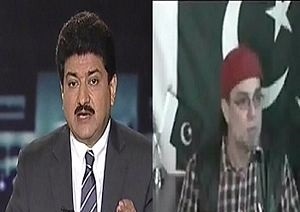 Hamid Mir and Zaid Hamid are two popular names of Pakistani Media. Hamid Mir is a famous Journalist who works for Geo News and he is often criticized for speaking against Pakistan Army and ISI. His opponents calls him agent of Foreign agencies. On other hand Zaid Hamid is a analyst who is more popular on Social media as compared to Electronic Media. Now a days we are seeing a verbal war between Zaid Hamid and Hamid Mir. Zaid Hamid is targeting Hamid Mir and other Journalist like him through Social Media. According to Zaid Hamid many Journalists like Hamid Mir are on payroll of foreign agencies and their agenda is to malign Pakistan army and ISI for everything. On other hand Hamid Mir has also launched attack on Hamid Mir. Hamid Mir done a complete capital talk show against Zaid Hamid in which he invited Tahir Ashrafi and foreign secretary of Zaid Hamid to speak against him. Hamid Mir also announced to go in court against Zaid Hamid. Geo News is facing massive criticism in Social Media now a days. People are criticizing Geo News for its Pro Indian stances, giving less coverage to issues like Kashmir and showing programs against Pakistan Army. This war has also effected viewership of Geo. Lets see where this war will go in coming days and how it will effect Geo?